It's certainly not common, but I saw it a few times when Gamecube games were still in shops, and a quick ebay UK search bought up about 10 results. The Last Horseman wrote: I have Cubivore. I bought it around 2005 or so, cost me around $19 dollars or so. Money well spent. I really like it. I've looked into Doshin a time or two, but I don't see it being worth importing. Too much trouble. I'm learning about Cubivore as I play it. Interesting how some of the Mutations help or hinder in defeating the next boss. Sometimes I hit the wrong mutation and lose some capabilities. However, the more mutations the better, to get to the Final stage. CRTGAMER wrote: I am curious about Doshin the Giant which only saw a Japan and PAL release. Is it hard to find in Europe? I assumed on EBay that Doshin would be pricey, you spiked my curiosity to look. Found one in the UK with a Buy Now and ships to the U.S at a reasonable price! Game is on the way! Doshin Giant reminds me of the PC game Black & White. I'm not sure if Action Replay Freeloader which does convert PAL to NTSC would work well on Doshin from Europe. Ah well, the OCD collector in me wants this game! I'll post a review how this PAL game turns out. I wonder if the Japanese version is English language friendly? Nintendork666 wrote: I've had my eye on Cubivore for quite some time now, but like you stated - it's extremely hard to find copies in the wild. Ordering it online is always an option, but I always end up spending my cheddar towards something else. You can get Cubivore shipped, you also have an advantage of a friend working at Gamestop. I wrote a HUGE Rant on this and Copy and Pasted it in the Cubivore Review on the previous page. Look for the SHOW Tag towards the bottom of the Review above the Rubics Cube pic. Click the Show Tag, be sure you have a cup of joe on hand. Uncommon game on the way! PAL Doshin the Giant. Look at that beautiful PAL Game Cube case! CRTGAMER wrote: I'm not sure if Action Replay Freeloader which does convert PAL to NTSC would work well on Doshin from Europe. Ah well, the OCD collector in me wants this game! I'll post a review how this PAL game turns out. I wonder if the Japanese version is English language friendly? My scheduling skills have died of dysentery; I hope to visit at least on a monthly basis. Still, don't forget to tip your waitress. 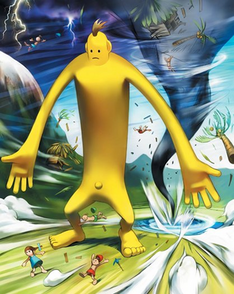 I've always been curious about Doshin the Giant ever since I saw the trophy for it in Super Smash Bros. Melee. I wonder if forcing 60hz on it will allow it to play and be in color as well. Good luck! What does the US Gamecube Box look like then? I just assumed they were the same. He's not talking about the box art, he's talking about the case itself. dogman91 wrote: I've always been curious about Doshin the Giant ever since I saw the trophy for it in Super Smash Bros. Melee. I wonder if forcing 60hz on it will allow it to play and be in color as well. Good luck! Thanks for the YouTube link. I normally hate slugging thru a Video Review, but that was entertaining! Luckily the memory card issue is only between different language formats. PAL and U.S. are compatible. I actually managed to get the Japanese Hudson series to save on the same Memory card as some U.S. saves. AR Freeloader booted imports save in compatible files between languages. Action Replay Freeloader converts PAL 50hz games to run in NTSC 60hz. From my experience with PAL converted games, you lose a few lines on top and bottom unless the game itself has a 60hz display option. Also there is an issue if the screen will be centered and not lose anything important off screen such as a corner life bar stat. I actually had to shift a PAL PS2 game higher then center to get all the information on the screen. Last edited by CRTGAMER on Tue Dec 13, 2011 4:51 pm, edited 2 times in total. AppleQueso wrote: He's not talking about the box art, he's talking about the case itself. So was I. I didn't know it was any different. Note the different style disc holder in the PAL case compared to a U.S case. The PAL case is similar to a PS2 disc holder, press the prongs down to release the disc. In the U.S. case the fingers are hard to push down and can really grab, a risk of cracking the center of the game disc. As a preventative measure I pinch in all the fingers with pliers for a permanent fix. The game discs now pop in and out easily. Last edited by CRTGAMER on Thu Dec 15, 2011 12:58 pm, edited 2 times in total.